Held from a traditional chain link, this round wall mirror features a streamlined iron frame. An antique brass finish emphasizes character throughout this round wall mirror from Arteriors Home. Beveled glass is applied as a distinguishing detail that evokes quality. With both a mounting hook and security cleat, installation is easy with the included hardware. 24" wide x 48" high x 1" deep. Hang weight is 12.35 lbs. Round wall mirror from the Arteriors Home Fletcher Mirror collection. Mounting hook and security cleat hanger; hardware included. Antique brass finish over brass frame construction. Beveled glass. 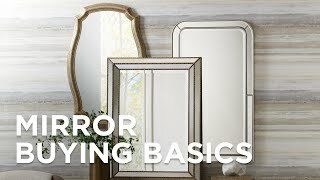 Is the mirror's weight supported at the top hook or behind the mirror? BEST ANSWER: Hi - The mirror is suspended by the wall mount hook assembly, but it also includes a security cleat which attaches to the back of the mirror for extra support. Gray and white natural mother of pearl tiles create the glamorous frame pattern on this traditional rectangle wall mirror. Upgrade a room to traditional elegance with this stunning gray and black mother of pearl round wall mirror as an accent.